KUALA LUMPUR (Nov 13): The FBM KLCI reduced losses to end flat as plantation stocks took a beating on expectation of weaker quarterly earnings. At the 5pm closing bell, the KLCI slipped 0.43 point or 0.02% to 1,815.81 points, led by losses in plantation heavyweights. These include Felda Global Ventures Holdings Bhd, PPB Group Bhd, Kuala Lumpur Kepong Bhd and IOI Corp Bhd. “The market is cautious on lack of catalysts," Lee Cherng Wee, JF Apex Securities senior analyst, told theedgemarkets.com. From a technical viewpoint, Lee said the KLCI's marginal decline followed the index’s failure to break past the 1,860 resistance level. TA Securities Holdings Bhd said in a note today it lowered the immediate support for the KLCI towards 1,800 points. TA said weak technical momentum and a lack of buying support implied further room for stock price correction from current levels. Across Bursa Malaysia, 1.7 billion shares worth RM1.7 billion were traded. Market gainers trailed decliners by 245 versus 553 while 307 counters were unchanged. The top gainer was British American Tobacco (M) Bhd, while the leading decliner was Allianz Malaysia Bhd. The most-active counter was Jasa Kita Bhd. Elsewhere, Japan’s Nikkei 225 was up 1.14%, but South Korea’s Kospi fell 0.34%. 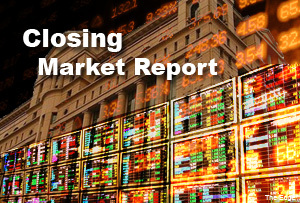 In China, the Shanghai Composite ended 0.36% lower, while Hong Kong’s Hang Seng closed 0.37% higher. Reuters reported that Asian shares were resilient in the face of a cooling Chinese economy while oil prices flirted with multi-year lows - unable to stem a drawn-out decline on fears of a glut. Growth in China's industrial output declined more than expected to 7.7 percent from a year earlier, while fixed investment growth slumped to a 13-year low, and the tempo of retail sales slowed.